Fig trees are prolific fruit bearers and easily propagated by taking cuttings from the woody branches. The best time to take cuttings from the fig tree for propagation is in the late winter or just before the last frost for your climate area. In fact, many cuttings can be rooted in a single 6-inch diameter pot. Using a 2L soda bottle acts like a mini-greenhouse, and within three weeks new shoots and leaves will be growing on the once-bare stemmed cutting. Combine a mixture of four parts potting soil to one part sand. Mix thoroughly. Fill the 6-inch diameter pot to the upper rim with the dry soil mixture. Take stem cuttings from the fig tree you wish to propagate. The stems must be no larger than 3/8 inch in diameter and no longer than 8 inches. Cut the stem diagonally with the knife in a clean and smooth motion. This will make a larger surface area for the roots to take hold, and allow for greater moisture up take to the stem cutting. Dip the cut end of the stem cutting into the rooting hormone. Coat the end approximately 1½ inches to 2 inches long from the base in the white powder. Insert the cut end of the stem into the pot with the soil mixture. You want at least 4 inches of the cutting in contact with the soil. You can place up to five cuttings in a single 6-inch plastic pot. Water the cuttings in the pot with approximately 1 pint of water. Leave the pot to sit for 24 hours so all excess water drains from the pot. Cut off the bottom of the 2L soda bottle with the scissors. Only remove the lower 1 inch of the bottle. Leave the top cap in place. Wash out the bottle. Rinse with clean water. Place the soda bottle over the cuttings, like a mini-greenhouse, after the 24-hour period. Set the plastic pot, mini-greenhouse, in a window that does not have direct sunlight. Direct sunlight will cause the cutting to overheat and die. Leave the cutting alone for two weeks. Do not touch the pot or lift the soda bottle before that time. The cuttings will begin to show green growth on the stem in about seven days. Lift the soda bottle from the plastic pot, after two weeks, and water the fig cuttings with ½ cup of water only. Replace the bottles over the plants. 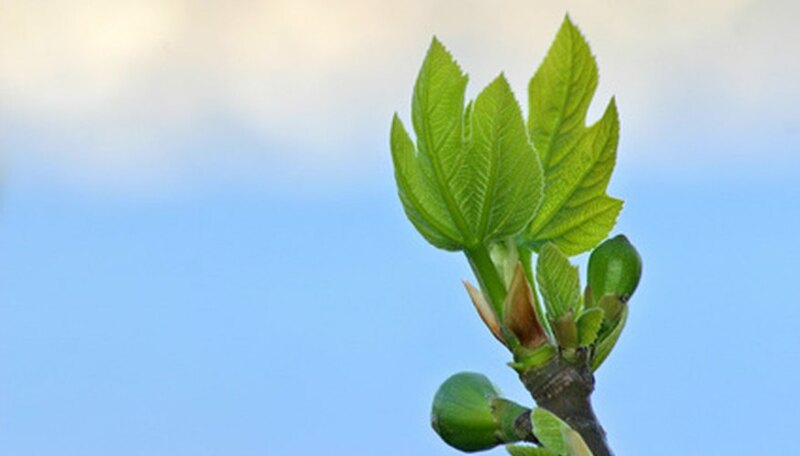 Remove the bottles from the new fig trees after you observe leaf growth that is in the range from 1 inch to 1½ inches in diameter. Water the new fig trees with 1 cup of water every week. If the soil feels too moist, do not water. It is better to underwater the new trees than overwater the plants. Transplant the new trees outdoors well after the last frost has occurred for your area. The soil temperature should be greater than 60 degrees Fahrenheit. Never overwater the fig cuttings. It is best to keep them on the dry side as the plants do best in dry climates. Keeping the plants under heavy moisture may cause fungal growth to the seedlings. Do not fertilize the cuttings while the stems are rooting. The extra salts in the fertilizer can cause the open wound at the end of the stem to dry out and cause the cutting to die.